Our Aloha ‘Aina gathering today started out with pule and ho’okupu at the Pu’uhuluhulu ahu. We then proceeded to the main gate area of Pohakuloa (mauka side of the Saddle Rd) for a one hour sign holding vigil. Several dozen bikers and others were already there as part of the pro-military Gathering of Eagles. They had only a few signs but lots of American flags, even an Israeli flag. Military jets and live fire bombing could be heard in the background. There are 7 photos below. The first 5 are people calling for stopping the bombing at Pohakuloa. The bottom 2 are those supporting the bombing. 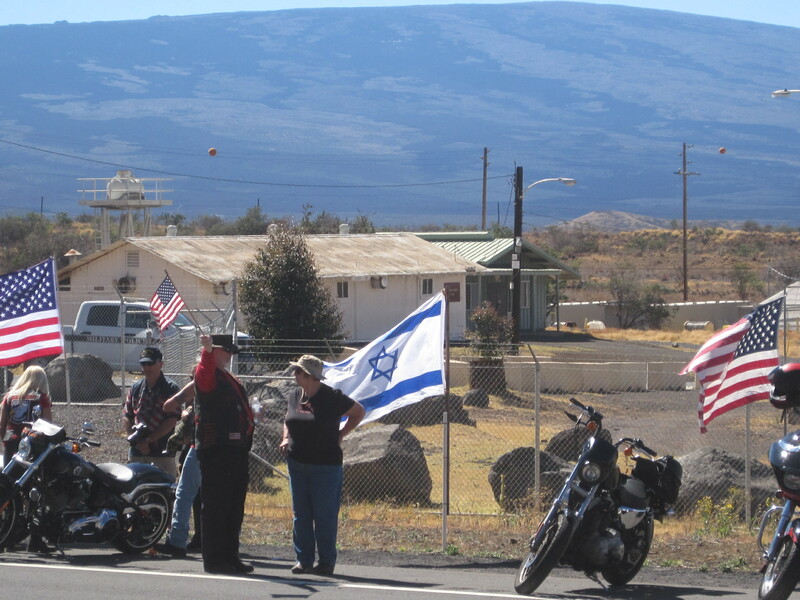 The group “Gathering of Eagles” must monitor our Malu ‘Aina website (www.malu-aina.org) and whenever we have a gathering at Pohakuloa, the Eagles are there to support the U.S. military. 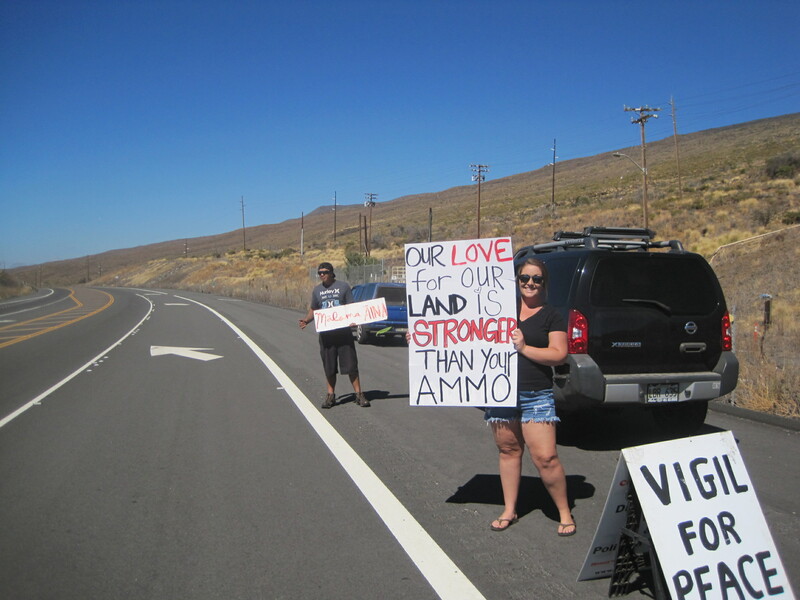 The event was mostly civil with the exception of an “Eagle woman” on a bull horn that some other Eagles refer to as “The Screaming Eagle” who hurled a few insults across the highway. 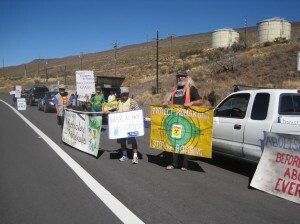 Our Aloha ‘Aina gathering concluded at noon with some prayers and chants facing Mauna Kea. As we left, we waved and exchanged words of aloha with some of the Eagles. We appreciate the good will of those Eagles who respect the right to disagree. 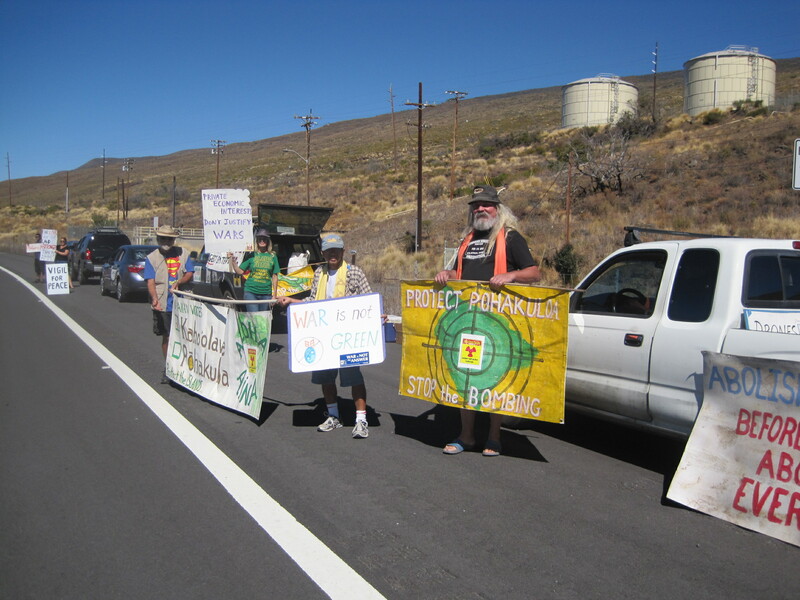 Those of our group that could were headed to the hale near the Mauna Kea visitors center for a meeting to discuss future strategy to protect Mauna Kea. 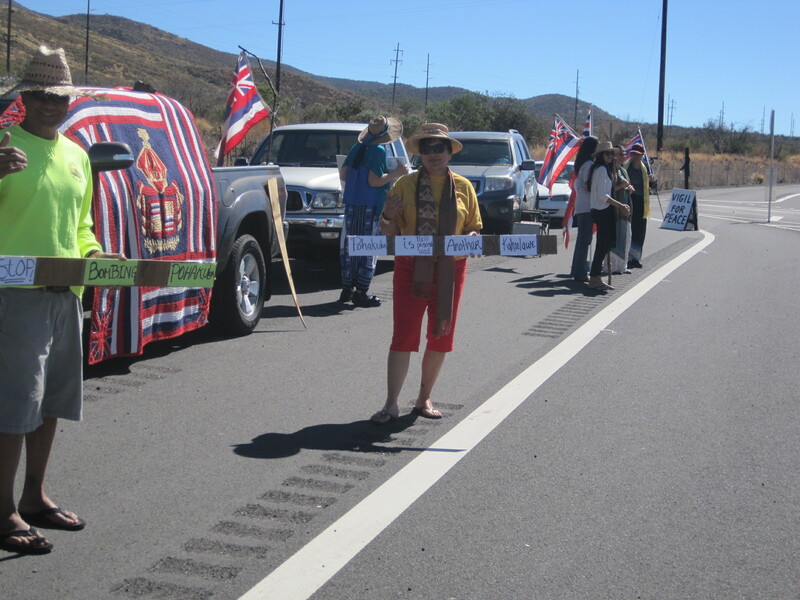 We took this action today to commemorate the 40th anniversary of the landing by 9 Hawaiians in Jan. 1976 to occupy the Island of Kaho’olawe in a call to Stop the bombing there. It was the birth of a movement. It took more than a decade, the loss of 2 lives –George Helm and Kimo Mitchell, and the imprisonment of others but the bombing was eventually stopped. 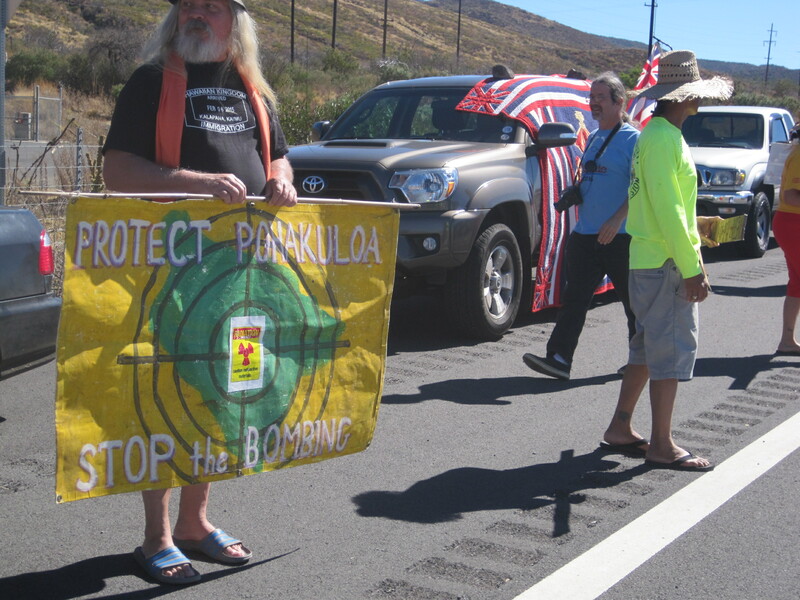 The action of the Kaho’olawe 9 and others inspire our actions today to Stop the Bombing of Pohakuloa. Mahalo for joining today’s gathering for Aloha ‘Aina, justice and peace. 1. 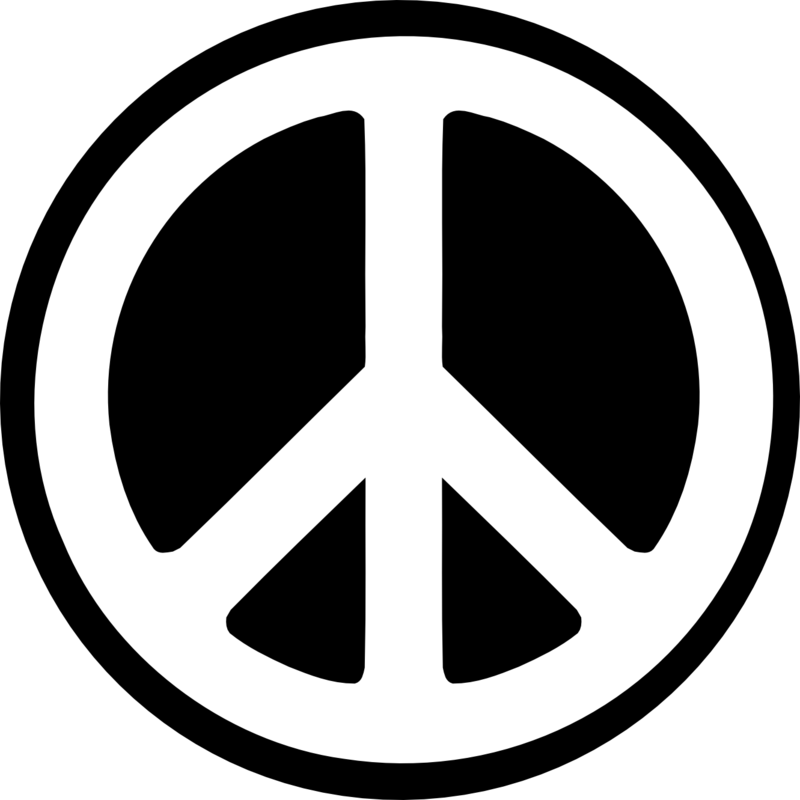 Please maintain a spirit of Kapu aloha –nonviolence, openness, and good will toward all we encounter. Treat others as you would like to be treated. 2. Please show respect to all people –even those who strongly oppose us and that for which we stand. Ignore any inflammatory remarks, jeers, insults, or other verbal abuse from opponents. Please do not return insults for insults, anger for anger, hate for hate. 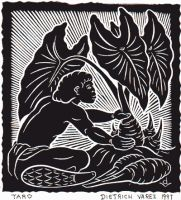 Keep a pono spirit, centered in Kapu Aloha. 3. Avoid hostile language, slogans and gestures. 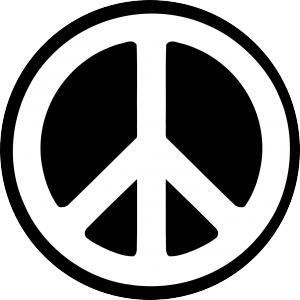 We will use no violence, verbal or physical, toward any person. Please keep children under close supervision and be safety conscious of traffic at all times. Great article. And with increasing climate disaster storms, there are likely more Fukushimas to come all around the world. January 2016 marks 40 years since the historic action of 9 people who went to the Island of Kaho’olawe to stop the bombing there. It sparked a movement. Many people followed in the months and years after. Some went to jail. Two — George Helm and Kimo Mitchell, lost their lives, but the bombing of Kaho’olawe was eventually stopped. Kaho’olawe is 28,000 acres. Pohakuloa, located in the center of Hawaii Island, is 133,000 acres, nearly 5 times the size of Kaho’olawe. 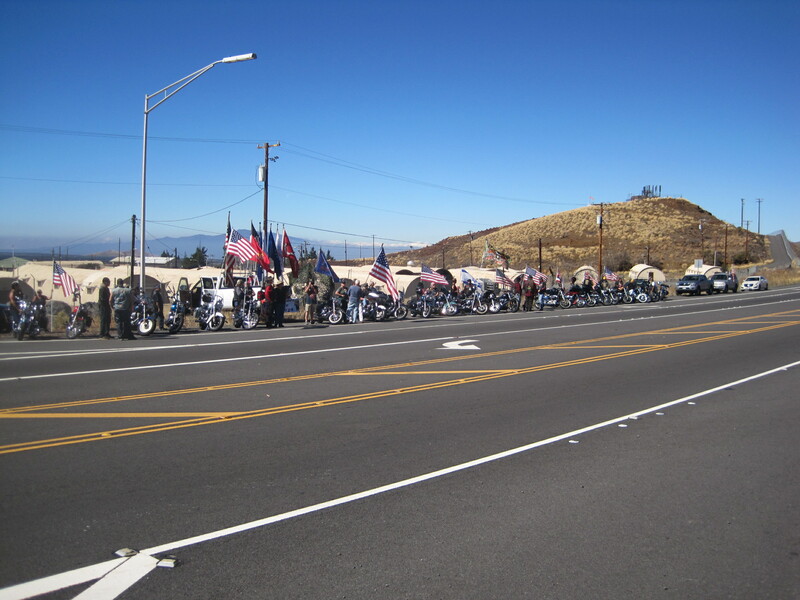 Millions of rounds are fired on Pohakuloa annually. It has been going on more than 50 years. It is time to Malama ‘Aina everywhere. It is time stop the bombing and desecration of Pohakuloa. We in Hawaii are part of a larger “Moana Nui” movement to demilitarize the entire Pacific. Pacific Island and Pacific Rim communities are currently actively mobilizing thousands of citizens–in Okinawa, Korea, Guam etc–against U.S. military bases. 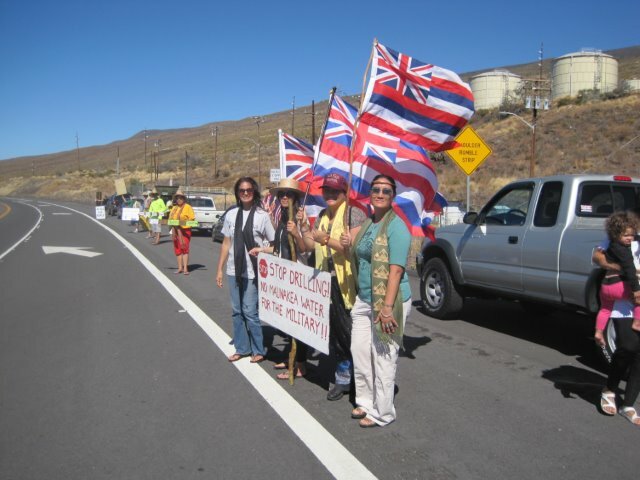 Please come in a spirit of Kapu Aloha for the ‘aina and all people we encounter, including those who may disagree with us. Mahalo.